Hi everyone, just thought I'd wish you all a Happy Easter and share a freebie with you with you which you can find below. I have done a few new templates this week and have also been trying out the latest update to Silhouette Studio software. They have now fixed most of the bugs and given us back some of the things they changed in the first update. We now have the old way of selecting cutlines back and also have the ability to save files in the V3 or V2 so we can still share files with people who haven't updated. All in all I think it's looking good now. Hope you like it and will leave me a comment if you decide to download it. This is lovely and thank you. Your other designs are beautiful and I especially like the lattice one. 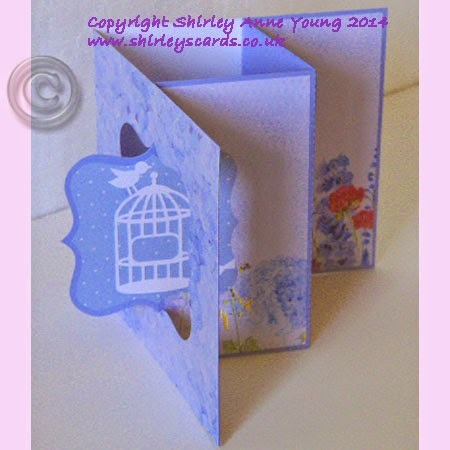 Shirley your cards and designs are beautiful.Thank you for sharing. Very Pretty. Thank you for sharing with us. All these are fabulous Shirley. Thanks for the freebie another fab one. Just to let you know we had a visitor bang on 10am ggggrrrrrr. so missed the program, going to look in a while and see what info they give on the Cameo video. Hope it's lots. Thank you so much Shirley for the wonderful files. They are so pretty. I recently got my Silhouette and I am so excited to make them. Thanks for sharing such an elegant card. Off today so intend spending time going back through your designs both here and in your shop. This is a lovely floral edge card that can be used with so many special occasions. Thank you for your generosity. Merci beaucoup de partager ces belles oeuvres. J'en ai pris quelques modèles... Salutations! Thank you for generously sharing your creativity with us! I downloaded your freebie file. thank you! Thank for for sharing this lovely file. I came across it on Pinterest and I'm glad I found your site. Lovely work. Thank you for a beautiful design. My first time on your web site. Looking forward to making the cards. I would like to get some of your freebies but I can't seem to download them. I can only download PDF files and I don't have a cutting machine I have to cut out all my patterns. Could you please use a PDF file also. Thank you so much for sharing your designs.